The Big Ten is home to a couple of really good races for division crowns. While Michigan may be the Big Ten’s only hope to go to the College Football Playoff, the divisional races will likely come down to the final week of the season. Here is how the teams stand heading into Week 11. 1. Michigan (8-1, 6-0 defeated Penn State 42-7)The Wolverines absolutely dismantled Penn State at the Big House. Michigan seems to be getting better every week, and last Saturday was no exception. Outside of Alabama, the best defense in the country belongs to Jim Harbaugh and the Wolverines. Michigan is poised for a playoff spot after Ohio State has looked unimpressive for several weeks. Michigan has two tune-up games against Rutgers and Indiana before the big showdown in Columbus against the Buckeyes in what will likely determine the Big Ten East Champion. 2. Ohio State (8-1, 5-1 defeated Nebraska 36-31)The Buckeyes haven't looked right for most of this season. Losing star defensive end Nick Bosa for the season has impacted Ohio State's defense. A lack of consistency in the running game has prevented the Buckeyes from asserting their dominance. However, talent often wins out and Ohio State still boasts an 8-1 record. The Buckeyes still have a path to the playoff, but it will require road wins against Michigan State and Maryland and another victory over Michigan at home. 3. Michigan State (6-3, 4-2 defeated Maryland 24-3)Michigan State has had an up and down season after several pundits picked the Spartans as a darkhorse for the college football playoff. Michigan State has ripped off three wins in four games following a disappointing home loss to Northwestern in week six. Backup quarterback Rocky Lombardi has played well in place of Brian Lewerke. The Spartan defense shut Maryland's explosive offense down. Can Michigan State replicate this stellar performance against Ohio State? 4. Northwestern (5-4, 5-1 lost to Notre Dame 31-21)Northwestern lose every single non-conference game on their schedule, yet they still sit in the driver's seat of the Big Ten West. Northwestern squandered an opportunity to spoil Notre Dame's playoff push, but they remain 5-1 in Big Ten play. The Wildcats haven't been impressive all season, but they find ways to win. Next week Northwestern faces a big test on the road against Iowa. 5. Wisconsin (6-3, 4-2 defeated Rutgers 31-17)Wisconsin was a team some analysts thought would dominate the Big Ten West and run away with the division. Touting what some believed to be the best offensive line in the country, the Badgers were expected to possibly contend for a playoff spot. Instead, inconsistent offense has left Wisconsin at 6-3. The Badgers will need road wins against Penn State and Purdue to keep pace with Northwestern for the division race. 6. Purdue (5-4, 4-2 defeated Iowa 38-36)Purdue is 5-1 following their uninspiring 0-3 start. Everything has changed for the Boilermakers. They still have an outside chance at the Big Ten West title. Although Purdue's defense leaves much to be desired, the Boilermakers offense is one of the most explosive in the conference. Jeff Brohm looks like one of the brightest young coaches in all of college football. Will he stay in West Lafayette for years to come or will he leave for greener pastures? 7. Iowa (6-3, 3-3 lost to Purdue 38-36)Iowa blew their chance to take command of the Big Ten West. Back to back road losses have the Hawkeyes' conference record back at .500. What looked like one of the more dominant defenses in the country has now given up 68 points in two games. Iowa finishes the season with games against Northwestern, Illinois, and Nebraska. Iowa will need to win out to earn a spot in the Big Ten Championship Game. 8. Penn State (6-3, 3-3 lost to Michigan 42-7)Penn State head coach James Franklin tried to make a statement following the Nittany Lions' loss to Ohio State in September. He declared Penn State was a great team, but they weren't yet an elite team. It turns out, Penn State might not even be great. Franklin's team is 2-3 in their last five games and this most recent loss against Michigan may have been one of the most embarrassing Penn State performances in recent memory. 9. Maryland (5-4, 3-3 lost to Michigan State 24-3)Maryland has had an odd season with an upset win against Texas and an upset loss against Temple. It seems appropriate that Maryland has a .500 conference record. Maryland has lost all three conference games they've been underdogs in, and they've won all three conference games they've been favored in. The Terrapins need one more win to be bowl eligible. 10. Illinois (4-5, 2-4 defeated Minnesota 55-31)Illinois has managed to squeeze out a second conference win. After defeating Rutgers, it looked like Lovie's Fighting Illini were doomed for an abysmal season. Then Illinois posted 55 points against Minnesota. Now the Illini are two wins away from becoming bowl eligible. Can they make it happen? 11. Minnesota (4-5, 1-5 lost to Illinois 55-31)To be frank, Minnesota looks terrible. PJ Fleck's second year as head coach of the Gophers has not gone as planned. Following a 3-0 start to the season, Minnesota has stumbled through conference play, winning just one game against Indiana. Minnesota will be underdogs in each of their final three games against Purdue, Northwestern, and Wisconsin. Can the Gophers avoid going 1-8 in the Big Ten? 12. Indiana (4-5, 1-5 bye week)Tom Allen's second year as head coach of the Hoosiers has been a complete and utter nightmare. You know you have serious problems when you only have one conference win and that win came against Rutgers. 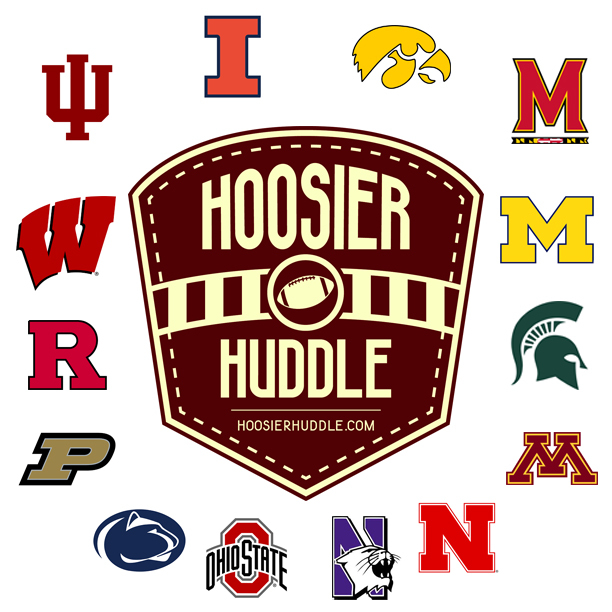 Indiana will need to win home games against Maryland and Purdue if they want to make a bowl game. Time is running out for the Hoosiers. 13. Nebraska (2-7, 1-5 lost to Ohio State 36-31)Nebraska looks infinitely better than they did earlier in the season. The Cornhuskers were competitive in Columbus and nearly pulled off the upset against the Buckeyes. In the end, Nebraska is still just 1-5 in conference. There is much to be excited about, however, with quarterback Adrian Martinez and an explosive offense. Scott Frost won't be losing seven games in a season much longer. 14. Rutgers (1-8, 0-6 lost to Wisconsin 31-17)If you don't have anything nice to say, don't say it at all. Well, not much can be said about Rutgers football. They are destined for a 1-11 season with zero conference victories. Will Chris Ash be the head coach next season?